The first annual Occipital Neuralgia Awareness Day is today, October 25, 2017! Occipital Neuralgia (ON) is a spinal nerve pain condition, not a cranial nerve pain condition. It is included here because it is a common condition among facial pain patients. 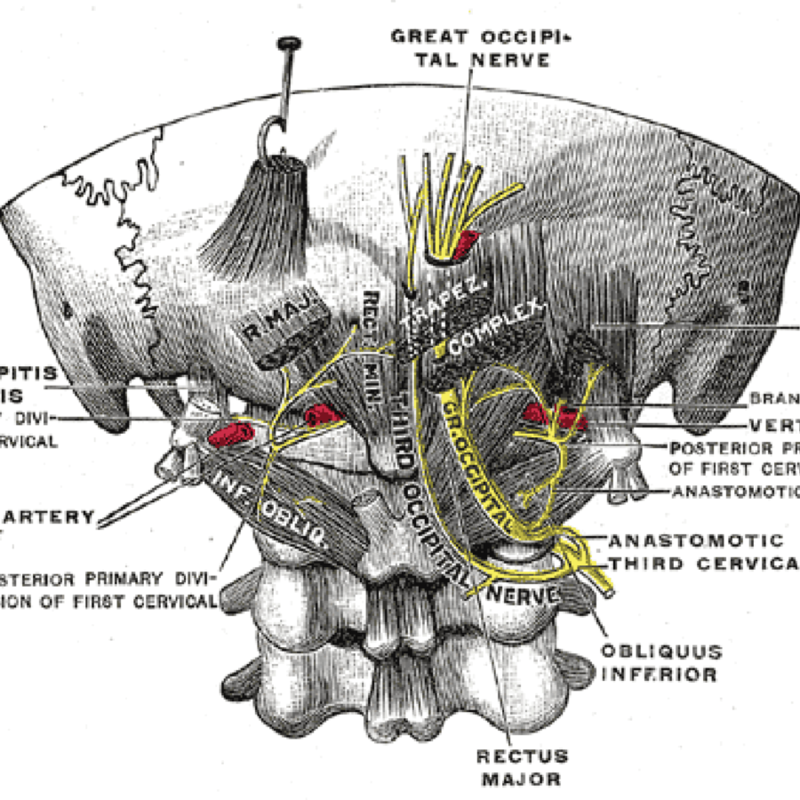 Occipital Neuralgia is a condition in which the occipital nerves are inflamed or injured. The occipital nerves run from the 2nd and 3rd cervical vertebrae up the posterior scalp (back of the head) to the vertex (top of the head.) The condition causes pain in the back of the head and/or the base of the skull. It is sometimes called cervicogenic headache. It is sometimes confused with migraine headaches because the symptoms can be similar. Like the cranial neuralgias, it is most commonly felt on one side of the head or the other, but it is possible to have bilateral occipital neuralgia. ON is the result of pressure on or trauma to the occipital nerve. This can occur due to injury, muscular entrapment, or inflammation. It is a potential complication of MVD surgery, because the area through which the surgeon accesses the cranial nerves is very close to the path of the lesser occipital nerves. Raising awareness of this condition is an easy way to have a major impact. Occipital Neuralgia is not a common diagnosis, even within the facial pain community. You could share this post on social media today, and very easily reach someone who has Occipital Neuralgia and has never heard of it before. GO FORTH TODAY, AND SHARE ON AWARENESS EVERYWHERE. Glad you approve, Jenny! 😉 We’re happy to be of service. I have this! People think I’m crazy when I to describe it. My primary care doctor. doesn’t understand why I’m still having symptoms since I was treated by a neurologist. I have pain every single day.